Extension to a semi-detached Victorian townhouse in the Victoria Park Conservation Area, creating a workshop and ensuite bedroom, emphasising volume and material continuity in relation to the house. 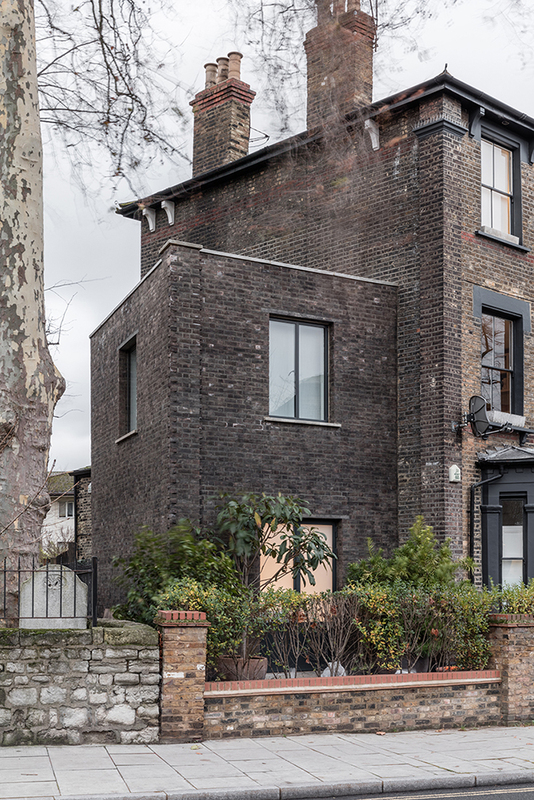 Wrong House is the extension to a semi-detached Victorian townhouse within the Victoria Park Conservation Area in East London for the furniture designer/maker Sebastian Wrong and jewelry maker Franca Berr. The proportions, materials and detailing of the project are developed to form an appropriate setting for Edward Charles Hakewill's Grade II* Gothic revival church, St John of Jerusalem (1848) which lies immediately to the West. The project provides a workshop and ensuite bedroom within a wedge shaped volume derived from the unusual geometry of the site. The facade of the new volume is set back from the street and follows the curve of Lauriston Road. This creates a subservient relationship with the original house, while at the same time establishing an independent identity within the wider context. The project adopts a monolithic approach to construction, emphasizing volume and material continuity in relation to the house. A thin black mineral wash unifies the the new brickwork walls, while a radial pattern of stock bricks forms a new paved landscape linking together the existing outdoor spaces.